Our team of expertise professionals enables us to provide a wide assortment of Instruments for Nephroscopy, which is fabricated from high grade of raw materials. This range of Nephroscopy Instrument finds its various applications in the examining the lesion in the stones and renal cavity. 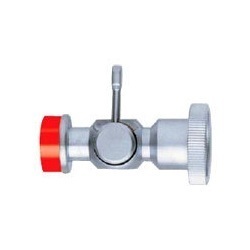 Our range includes Stopcock and Nephroscope, etc. 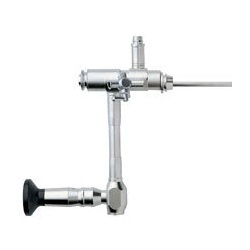 We are engaged in the manufacturing and supplying of qualitative range of Nephroscope. This range of Nephroscope is manufactured from premium quality of raw materials, which we sourced from reliable and trusted vendors. The various specifications of these products are working length 200 mm, 45° angled, channels 14 Charr, field of view 85° and various other features. 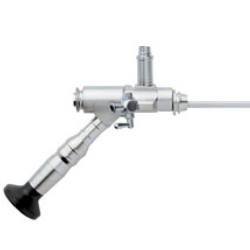 We offer a wide array of Clinical Nephroscopes, which is available with us with specifications like 85° field view, 200 mm working length, 90° angled and channels 14 charr. + 2 × 4, 5 charr. This range of right angled nephroscope is fabricated in our modernized production units using latest technology in compliance with various quality standards. This range is available with us at market leading prices.